African Pearl Safaris: Malakai Eco Lodge - Entebbe. Malakai Eco Lodge - Entebbe. Not far from Entebbe, the major gateway of Uganda is a reflection of the country's Safari lodges. 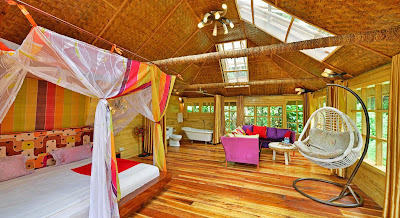 Malakai Eco lodge is a 20 minutes drive from the Airport in the safe environment of Kitende. The scenic gardens are perched with volcanic stone huts, fish pounds, a swimming pool and water fountains to create the Safari magic in the Pearl of Africa. Guests at the lodge are treated to continental and local cuisines in the gardens that are transformed to open air restaurants when the moon and stars light the sky. The en suite cottages are decorated to give an elegant feel; mosquito netting, large comfortable patio chairs. The cottages are equipped with all the comforts and facilities of eco-friendly rooms. They are surrounded with a stunning garden with shady trees and colourful flowers. Budget guests are offered special rooms with shared bathroom. Malakai Eco lodge offers accommodation for families, couples and budget guests. Malakai Eco lodge is equipped with an elegantly furnished wellness and herbal clinic open from 8am to 6pm with a wide range of health, skin and beauty treatments. The clinic is equipped with massage beds, chairs, slimming chairs. The masseuses offer classic and shiatsu massages. A health nutrition expert is present to give diagnosis and health recommendations. For the more energetic, an open air gym and 11 metres long swimming pool are available. While at Malakai, get connected with nature given activities such as; Fishing, Bird watching and Monkey Viewing. The tranquil serenity of Malakai makes an irresistible combination for those wanting a truly memorable Safari break out of uganda’s magnificent parks. © African Pearl Safaris. Watermark theme. Powered by Blogger.